I finally finished hooking my rug titled, Women’s March 01-21-17. It is a tessellation of pussycat hats in various shades of pink to honor the Women‘s March last January. I knitted at least seven of these hats last year and some made it to the march in Washington DC. It was a small way for me to participate in what was the largest and most peaceful march in US history. It was also a march around the entire globe! This rug has a couple of feminist buttons pinned on it and I will be looking for a few more to add to it. It also has some velvet, sari silk, and strips of other colors that were donated by rug hooking friends, who wanted to contribute to my effort. I wanted to do a different binding combining a cord edge with a crocheted outer edge using some bright pink yarn left over from one of the knitted hats I made. After steaming the rug, I laid it right side up and arranged the cord [I use cotton clothes line] next to the outermost row of hooking and whipped it in place with dark red-violet wool yarn [I give a nod to Nancy Parcels' multi-cord edging technique here]. I then trimmed the excess linen to 1 ½” all around, folded it in towards the cord two times and then started to crochet. This didn’t create the coverage I wanted, so I decided to whip around the rug with the yarn using a blanket [or buttonhole] stitch. This created a nice beaded edge. Now I will continue hooking my Down to Earth2 round meditation mat and begin a super secret rug for a group project. So much to do! 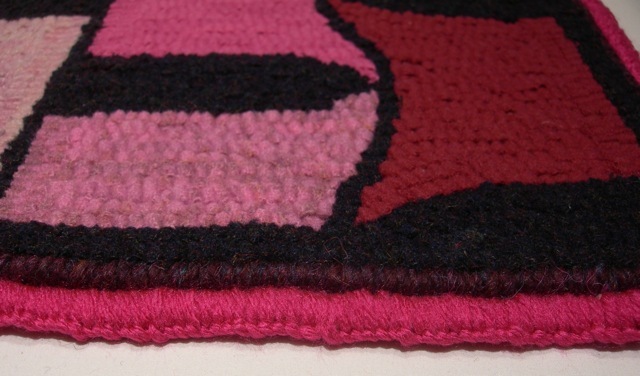 There’s a lot of beauty out there and in details that make a hooked rug special. A whipped cord and a buttonhole stitch whipping make a special finish on this rug. The finished rug and a great book filled with Women's March images from around the world. A winning name is drawn and other happenings. One does not have to be of Scots-Irish descent to be interested in the new book, Hooked on Celtic Rugs by Gail Lambert [© 2017 Ampry Publishing LLC / Rug Hooking], but there were certainly many of you, who claimed that heritage and hence have a special interest in winning this book of Celtic designs. The dye pot was overflowing with names. 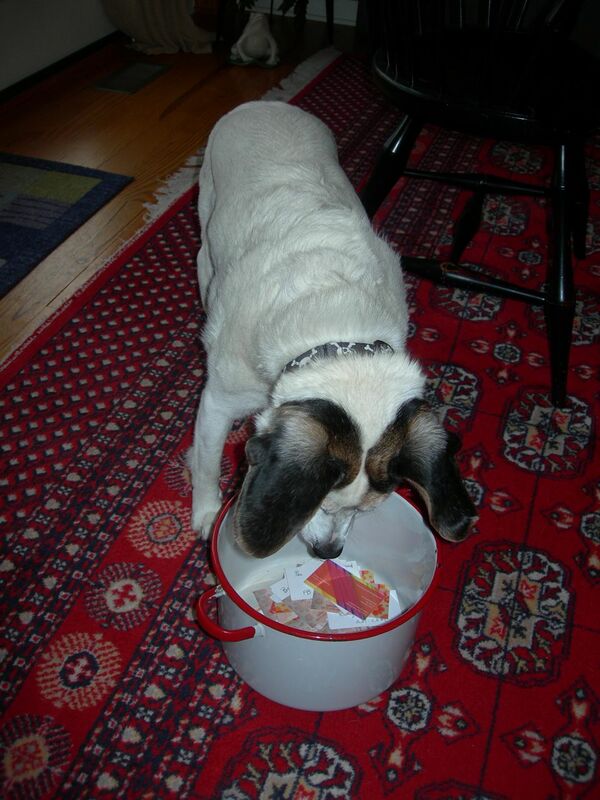 With a bit of help from Benji, one of my furry helpers, the winning card was drawn. Congratulations to Barbara Personette, who commented, “This looks like an interesting book. I’ve always liked Celtic designs.” Barbara, I will contact you for your address and send that book on its way to you. Last weekend I spent some time in Salem, Massachusetts with a friend. We have been there a few times in the past, but it had been about ten years since our last visit. Much has changed, but all the important and historic things are still there. We were there after the Halloween hoopla, so the crowds had thinned out. The clocks were set back one hour to Standard Time. This causes great distress to the four canines, who call this place home. I’m still trying to get them into the new routine. I would be so happy if we could all just stay with Standard Time and forget messing around with it every year. Does Daylight Saving Time actually save time? I don’t think so. There are still 24 hours in a day. We had our first snow last Tuesday and Crow's Foot Farm looked so lovely. Big soft flakes that coated everything in sight. I do love winter-y weather. My trips to the hen house become a bit of a slippery slog three times a day, but I’m willing to put up with it. My Down to Earth meditation mat is finished. I need to have it photographed and listed on the Shop page of my website. The pattern is available to buy and I will put two of your special spirit animals on it, if you’d like. I will now start designing a round one for seated meditation. Thanks again to Ampry Publishing LLC and Rug Hooking Magazine for the giveaway book. I love doing giveaways and it’s obvious that you all do, too. There’s a lot of beauty out there and in the first pristine snow of the season. Benji sniffs out the winner. 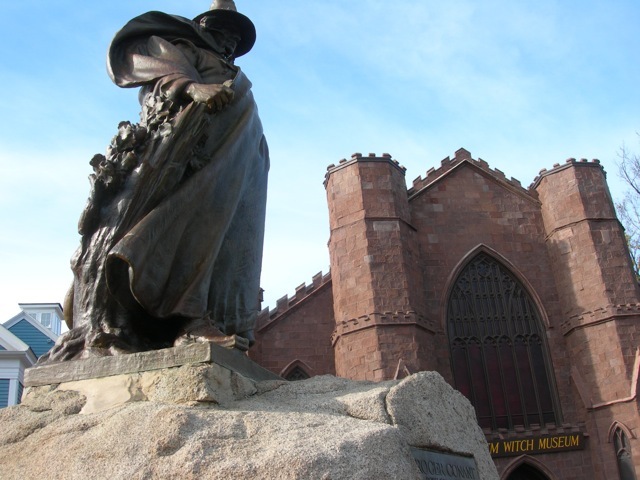 An iconic sight in Salem, Massachusetts. 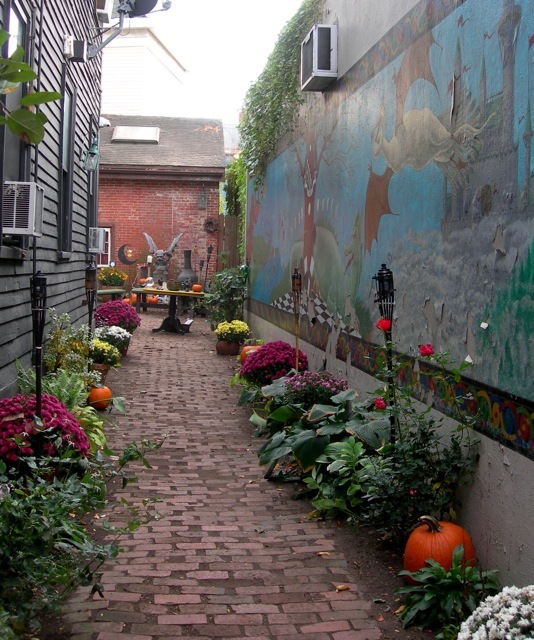 We found this alleyway intriguing, but off-limits. The beginning of the beautiful snowfall. Daniel Peifer, the German farmer who worked this land over 200 years ago, lies beneath his mulberry tree. A room full of rug hookers. Q: What do you get when you combine a gaggle of rug hookers, excellent vendors, and door prizes? A: The annual Brandywine Hook-In. Many thanks to the hard working members of the Brandywine guild for hosting another fun day of rug hooking and camaraderie on a beautiful October day. It takes a lot of planning and advance preparation to successfully host such an event. I brought along my Down to Earth meditation mat to bind. I got a bit done, but there were too many pleasant distractions. I will finish the whipping with yarn this coming week. This fun day was topped off with my winning of a great door prize! Tomorrow is Halloween, one of my favorite days of the year. Since moving here to PA, I have attended an annual spooky dinner at the Olde Log Cabin Homestead in Elizabethtown, PA. It’s a night filled with stories, traditions, and a solemn ceremony to remember our departed loved ones. I hope tomorrow will be a special day for you, too. There’s a lot of beauty out there and in the honoring of our dearly departed. P.S. Tune in next week when I will be doing another BOOK GIVEAWAY. This is a room filled with people focused on rug hooking and having fun. LC WoolnSilk's display of eye catching colors and texures. Jan Cole, the Wool 'n Gardener, had a garden of proddy wool flowers on bed springs. The Wool 'n Gardener's yummy bundles of wool. 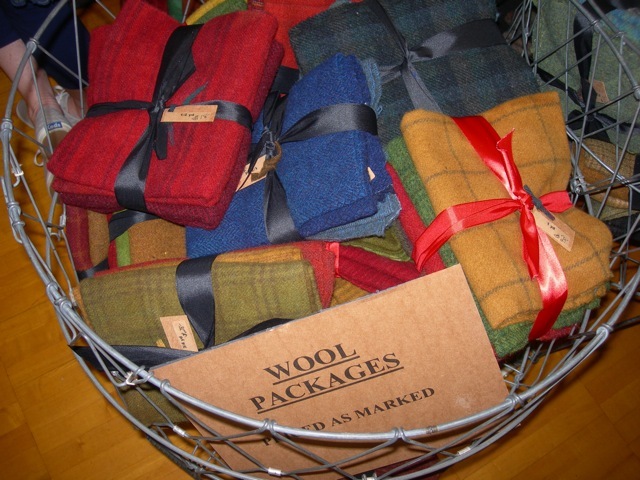 The Old Tattered Flag was there with all sorts of supplies for wool lovers. Sauder Village Rug Hooking Week is over for another year. I hope you were fortunate enough to be there, but if not, put it on your bucket list. I spent the week volunteering at the Rug Hooking Magazine booth with Deb Smith, editor, and fellow volunteer, Nancy Parcels. It is such a great week filled with all things rug hooking. While there, I went to Nancy Parcels’ dyeing demonstration on Thursday. Nancy demonstrated about five different ways to dye wool with and without dye. It was an inspirational workshop. Nancy and I also took a workshop on Saturday taught by Capri Boyle Jones. It was called, Small Works of Art. Fun class! The focus of the week, besides all of the retreats and workshops, is the incredible rug exhibit. At the center of the exhibit is the collection of this year’s winning rugs that are now published in Celebration of Hand-Hooked Rugs 27 [© 2017 Ampry Publishing LLC and presented by Rug Hooking]. I am delighted to have a copy of this book to give away! BOOK GIVEAWAY-- To get your name in the drawing, please leave a comment on this blog post on my website. NOTE: Below this blog post is the teeny tiny word “comment/s”. Click on that to open a space to type your comment. Be sure to sign in to leave your comment, so I will have your email address to contact you if you win. Your email address will not be used for any other purpose. The drawing will be held on Sunday, September 3rd at Noon [EDT]. I will announce the lucky winner in my blog on Monday, September 4, 2017. Good luck! Be sure to get your name in the dye pot for a chance to win this book! Entering the rug exhibit at Sauder Village. August is truly a summer month in every sense of the word. The weather is hot, the gardens are bursting and we are enjoying a visit from our son, daughter-in-law and granddaughter, Lucy. They live far away, so their visits are treasured. Perry County, PA is a quiet place full of country vistas, Amish buggies, and a slower pace of life. Our plans may include a trip to the safari park, swimming at the big pool at Buffalo State Park, a proper luncheon at a tea shop, possibly a visit to an amusement park, and definitely hosting our annual corn hole party. 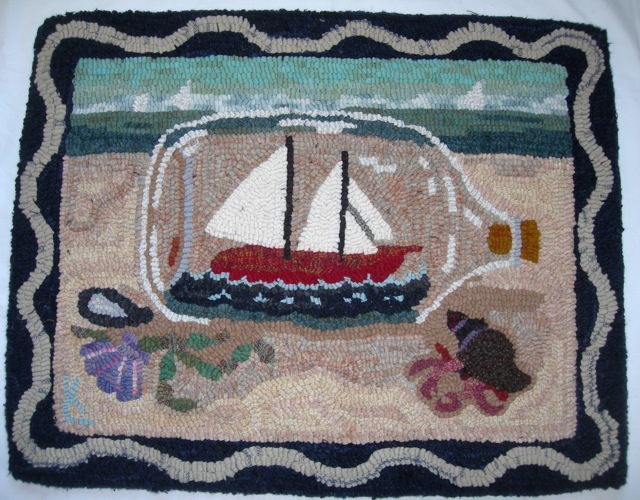 So, with summer in mind, I’ll share some of my Cape Cod inspired rug designs. I’m excited that I will be going to the Cape once again at the beginning of October. That’s my favorite time of the year when there are fewer vacationers and a more laid back pace. These designs are available as patterns on the Shop page of my website. There’s a lot of beauty out there and in the special times with family. 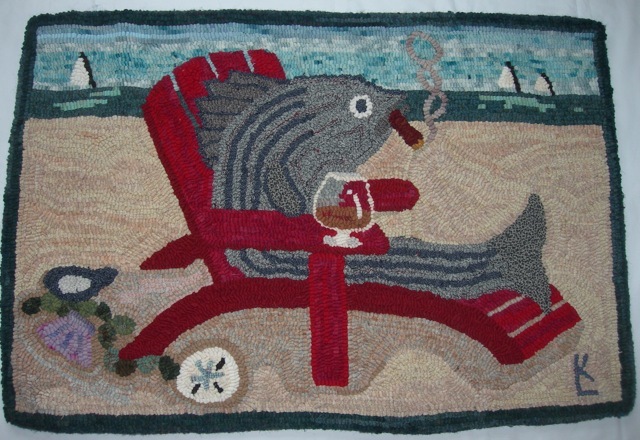 Smoked Bass, a whimsical rug I designed for my brother and sister-in-law. Ship in a Bottle, one of my favorite designs. 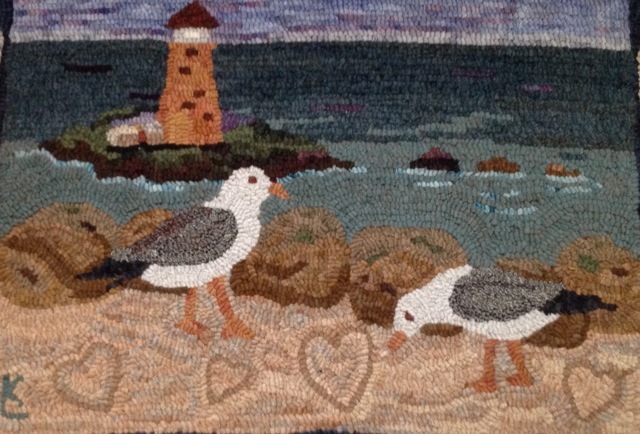 Cape Cod Tidal Pool, a rug I donated to a fundraiser. Wedding Day, a rug designed for a friend's son. 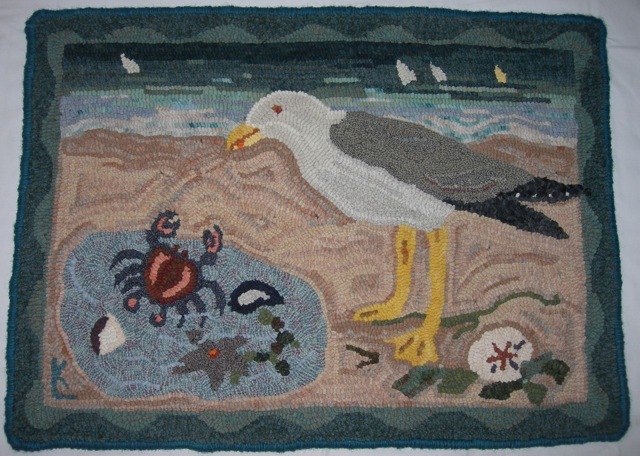 MJ's Tidal Pool, a rug hooked for a friend.